This is the eighth installment in our ongoing oral history project. You can read previous chapters here. A lot happened in 2013. 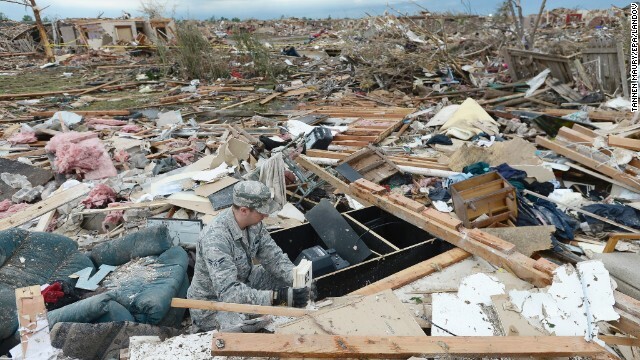 One OILer lost his house in the Moore tornado that gained worldwide attention. Two brothers-in-arms died. Four managers had children born. There were trips to Lambeau Field and Cowboys Stadium. A new champion was crowned. And one of the OIL's own became "Top." In May, two-time OIL champion Jack Bruesch lost his house in the Moore tornado. Fortunately, he and his family were uninjured, and OIL members and more came together to help in any way we could. Bruesch's home after the Moore tornado. CLIBURN: On a lighter note, it's a good thing I won the OIL and DBFA trophies back from Bruesch in 2012. Otherwise, those trophies would have been lost in the tornado rubble. BRUESCH: I guess that's one silver lining of the whole thing. CLIBURN: We can joke about it now, but I was really worried about Bruesch on the day of the tornadoes. I couldn't get ahold of him, and I knew his house was in the path. Thankfully no one in his family was seriously injured though. On a more somber note, 2013 was also the year the OIL buried friends and brothers-in-arms. 1LT Brandon Landrum died in May from an IED explosion in Afghanistan. Members of the OIL knew him as SPC Landrum. CLIBURN: Landrum was a medic and spent 2008 in Iraq with the 158. He went to the same high school and college as me, although we were in different classes. He had transferred to active duty as a commissioned officer when he died. DUFFY: He trained with me at a "war fighter" exercise when he was still with the 158. CLIBURN: I just remember how much he made us laugh at Camp Gruber. He'll be missed. Congratulations to Aaron Cobb. His Dogs of War defeated the defending the 2012 champions in the OIL Bowl. This is Cobb's first OIL championship. He overcame injuries to, among others, Arian Foster, Jermichael Finley, and Wes Welker on his way to the championship. The Dogs of War finished the regular season with the third-highest point total in the league. They finished the season 10-6. He'll soon receive the Harrington Trophy in the mail, just in time for Christmas. The Arrogant Americans finished 9-7 after going into the playoffs with the most points in the league. They've now been to four OIL Bowls and won two of them. The Dogs of War overcame a first half injury to Steve Smith to win the OIL Bowl. His RB trio of Reshard Mendenhall, Marcel Reece, and Bilal Powell each outscored the number one overall pick, Adrian Peterson. Peyton Manning outscored Tom Brady by 30 points and Steven Hauschka had his worst game of the season for the Arrogant Americans. The Dogs of War will now represent the OIL in World War IV against the winners of the MGL and the Norse. OkIraqi Jack Bruesch loses home in May 20 tornado. As you know by now, Central Oklahoma was devastated yesterday by a massive tornado. Parts of Moore and south Oklahoma City are completely flattened. While we are grateful that he and his family are alive and well, we regret that 2008 and 2011 OklahomIraqis League champion Jack Bruesch lost his home in the tornado. He is staying with family right now in Norman, but he can use all the help he can get. On behalf of the OIL, I have started a Wal-Mart gift card for him. It is reloadable, so anyone is welcome to add funds to it. If you want to send money directly to Bruesch's gift card, I am typing instructions below. It is not very user-friendly, but it's what I could put together on the fly. Please share this with whoever you can. EDIT: I've deleted the gift card information. Thank you to everyone who helped.